The Hudsonian godwit (Limosa haemastica) is a large shorebird in the sandpiper family, Scolopacidae. The genus name Limosa is from Latin and means "muddy", from limus, "mud". The specific haemastica is from Ancient Greek and means "bloody". An 18th century name for this bird was red-breasted godwit. The English term "godwit" was first recorded in about 1416–7 and is believed to imitate the bird's call. They migrate to South America. These birds gather at James Bay before fall migration. In good weather, many birds make the trip south without stopping. They are vagrants to Europe, Australia, and South Africa. They can perhaps be most easily seen in migration on the east coast of North America where they can be plentiful in migration in late July through early August. Their numbers were reduced by hunting at the end of the 19th century. 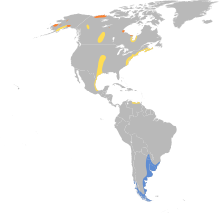 ^ BirdLife International (2016). "Limosa haemastica". The IUCN Red List of Threatened Species: 2016: e.T22693154A93386036. doi:10.2305/IUCN.UK.2016-3.RLTS.T22693154A93386036.en. ^ Jobling, James A (2010). The Helm Dictionary of Scientific Bird Names. London: Christopher Helm. pp. 184, 227. ISBN 978-1-4081-2501-4. ^ a b c Godfrey, W. Earl (1966). The Birds of Canada. Ottawa: National Museum of Canada. p. 163. ^ Sibley, David Allen (2000). The Sibley Guide to Birds. New York: Knopf. p. 177. ISBN 0-679-45122-6. Wikimedia Commons has media related to Limosa haemastica. "Hudsonian godwit media". Internet Bird Collection. Audio recordings of Hudsonian godwit on Xeno-canto. This page was last edited on 8 July 2018, at 12:25 (UTC).